With just a glance, you can see the prominent Les George Design influence in the Kershaw Seguin. Named after Juan Seguin, a hero of the Texas Revolution, the Seguin is all about form and function. From the machined stainless handle to the aggressive clip point blade, this knife is ready for action. The Blade: Razor sharp out of the box and easy to resharpen down the road, 8Cr13MoV stainless steel forms the versatile clip point blade. A Gray PVD coating adds to the good looks of the Seguin while also protecting the blade and boosting hardness. 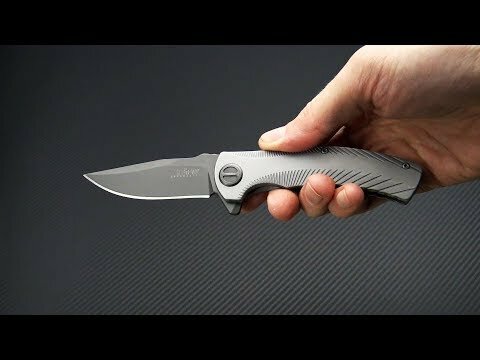 An easy to access flipper tab combined with Kershaw's Speed Safe Assisted Opening allows for quick deployment when needed most. The Handle: All stainless steel construction gives this folder a substantial in-hand feel while keeping the weight at a moderate 5 ounces overall. Heavily machined to add texture, grip and style, the handle of this mid-sized folder is comfortable and secure. Sturdy and easy to manipulate steel framelock backside for rock solid lock-up. Completed with single-position deep-carry pocket clip (right, tip-up).